A series of processes is now converging to force the issue of sustainability to drive South Africa's low-carbon energy transitions. This raises the question of how a 'sustainability transition' framework can be conceptualised to address the challenge of low-carbon electricity transitions in South Africa. This paper, therefore, critically reviews the strategic electricity planning process in South Africa within an established sustainability transitions theoretical framework. From the literature, it is observed that the challenges facing South Africa's strategic electricity planning resulted from the related politics, from differing views owing to different stakeholder preferences and lack of transparency in terms of electricity planning, and from a lack of, or misalignment between, development policies and objectives. All these theoretical and practical gaps reveal that South Africa must rethink its current strategic electricity planning practice, especially considering the country's political economy. This paper, therefore, proposes a conceptual complexity-planning framework to ensure that the complex sustainability policy objectives are aligned within the electricity planning process. 'n Reeks prosesse konvergeer nou om die kwessie van volhoubaarheid, en Suid-Afrika se lae-koolstof energie-oorgange, aan te spoor. Dit laat die vraag ontstaan hoe 'n raamwerk vir 'volhoubaarheid oorgange' gekonseptualiseer kan word, om die uitdaging van 'n lae-koolstof elektrisiteit oorgang in Suid-Afrika aan te spreek. Hierdie artikel verskaf dan 'n kritiese oorsig oor die strategiese elektrisiteit beplanningsproses in Suid-Afrika, opgestel in 'n gevestigde volhoubaarheid oorgange teoretiese raamwerk. Uit die literatuur is dit opgemerk dat die uitdagings in Suid-Afrika se strategiese elektrisiteit beplanning 'n gevolg is van die verwante politiek, verskillende sienings as gevolg van verskillende voorkeure van belanghebbendes in terme van die beplanning van elektrisiteit, en 'n gebrek aan, of uitlynfout tussen, ontwikkelingsbeleid en doelwitte. Al hierdie teoretiese en praktiese leemtes toon dat Suid-Afrika sy huidige strategiese elektrisiteit beplanning praktyk moet herbesin, veral met inagneming van die politieke ekonomie van die land. Die artikel stel dus 'n konseptuele kompleksiteit-beplanningsraamwerk voor om belyning van verskillende, mededingende, en komplekse volhoubaarheid beleid doelwitte te verseker binne die elektrisiteit beplanningsproses. Strategic planning is an organised process of foresight, with set procedures to maximise and formulate the potential success of any plan . Although strategic planning is associated with problem-solving, its distinctive characteristic relates to clusters of interrelated decisions. The problem it addresses is coordination . The general theory of strategic planning has three pillars: goal formulation, problem definition, and the associated social context . In defining dilemmas faced by this theory, Rittel and Webber  highlight that strategic planning challenges are inherently 'wicked' - especially those of policy planning - as they are ill-defined and rely on elusive political judgement for resolution. The consequence is not-so-perfect solutions to uncertain, complex, and normative problems - including viable solutions that are less perfect, but responsive to different rationalities [3,4]. There are various theories of strategic planning. One of the main ones is the synoptic approach, which has dominated planning practice (especially in development planning programmes), including sector-based strategic planning. Synoptic planning has four classical elements: goal-setting, identification of policy alternatives, evaluation of means against ends, and implementation of decisions. Other theories that depart from the limits of the synoptic approach include: incremental, transactive, advocacy, radical planning, and other varying forms of contemporary planning traditions [4,5]. Energy planning1 as a tool for sector-based strategic planning uses synoptic planning as its theory base, but also considers political aspects, and social and environmental considerations [7,8]. Energy-planning approaches are generally classified into three categories: planning by models, by analogy, and by enquiry . However, with increasing public awareness of sustainability issues in relation to energy demand and supply, strategic planning frameworks for this sector have evolved . Despite the potential provided by the various approaches to deal with the complexities and uncertainties of today's strategic planning for the delivery of sustainable energy services, there is still a lack of coordination, misalignment, transparency and minimal integration of the current approaches for the electricity sector specifically, especially with other key strategic national plans and policies aimed at meeting sustainability goals. This requires the modification of existing strategic planning approaches, such as the Integrated Resource Plan (IRP), to fit the new power utility business environment [9,11,12]. Against this backdrop, this paper posits a planning approach intervention (in the form of a framework) that can be incorporated into the existing IRP development process as a way of building capacity to address the complexities, both historical and current, and the gaps currently faced by the electricity sector. The IRP is an approach that meets the estimated long-term requirements for electricity services over a specified period with a least-cost combination of supply and end-use efficiency measures, while incorporating equity, environmental protection, reliability, and other country-specific goals , to provide an integrated plan for the power system . Figure 1 provides an overview of the IRP as an electricity sector planning approach. The concept of the IRP has been introduced in many developing countries; however, only a few utilities in these countries have developed a comprehensive plan based on an IRP . China, Brazil, South Africa, India, and Thailand have each initiated unique approaches to developing IRPs [9,12,13]. Coincidentally, in these countries, various challenges and complexities brought by privatisation, deregulation, the new role of the state, independent power producers, environmental and climate change issues, developmental challenges, competition issues, and tariff and cost of production issues, have influenced and prompted IRP development and its modification (including the introduction of new frameworks) as a strategic planning approach. The aim of these interventions has been mainly to address the new power utility business environment, which is driven by various stakeholders who sometimes have varying and competing sustainability objectives [9,11,12]. The complexities identified and observed in the IRP as a strategic planning approach come from its supply bias, stemming from the belief that augmenting generation capacity is the only effective way to meet projected electricity demand [13,14]. Consequently, the forecasting tools that are used as part of the IRP process assume future capacity without considering demand reduction through increased efficiency . Also, the competing roles and objectives of various institutions that have a direct impact on the electricity sector result in further misalignment and lack of coordination. In this case, related subjects - such as water conservation, climate change, human settlements, and so forth - are treated as different sectors; the controlling government departments are separate entities whose related programmes are planned, to whatever extent, independently of one another . Lately, within the planning process itself, including external costs for electricity generation (externalities) has also become prevalent. The IRP is thus forced to include, to some extent, quantitative and qualitative costs and benefits caused, for example, by air pollution, water quality impacts, water consumption and pricing, greenhouse gas emissions, health costs, and the socioeconomic benefits of electrification. However, governance structures and processes to ensure the appropriate identification, assessment, and management of some of these externalities are still lacking [12,14,15]. In addition to governance challenges, the restructuring of electricity utilities tends to preoccupy those in authority to the exclusion of other important stakeholders and longer-term strategic planning issues [10,12,13]. As observed, the IRP as a strategic planning approach faces challenges, and thus requires specific interventions. The next section explores complexity and governance, with the aim of providing a possible solution to the IRP as a strategic approach. According to Loorbach , an emerging paradigm for analysing persistent problems is complexity theory2, which originates in systems theory3. As stated previously, wicked problems, related to system failures,4 are characterised as complex, as they are embedded in societal structures; and they are uncertain owing to their hardly reducible structural uncertainty [18,19]. Peter and Swilling  define the role of complexity theory as an overarching way of thinking, while understanding and acting on persistent problems, especially those relating to the process of transitions to sustainability. Persistent problems also tend to be difficult to manage (owing to the number of actors/stakeholders with diverse interests and objectives), hard to grasp (as they are difficult to interpret), and poorly structured [3,16,19]. While a single complex systems theory does not exist, it would have implications for how the structures of wicked problems are conceived and managed [18,19]). It would also assist in contextualising, framing, and integrating various sustainability-based theories with associated modelling methodologies for assessment, to address diverse and complex challenges, while further matching the adaptive management requirements (pluri-focal, multiscale, multi-level, and adaptive) for transitions to sustainability [17,18,19]). In governance processes, stakeholders and their varying and competing objectives co-evolve with these broader societal dynamics . In this context, Rotmans and Loorbach , Loorbach , and Peter and Swilling  propose the recognition of certain principles to define a system of governance based on complexity. The principles include flexibility and adjustability at a system level, with the dynamics of the system creating feasible and non-feasible means, and insights into how the system works, as an essential precondition for effective management. Long-term thinking should also shape short-term policy in the context of persistent societal problems, while timing issues of each intervention would be crucial and strategic. Creating space for agents to build up alternative regimes is crucial for innovation; thus stakeholders should be provided with a protected environment in which innovation could take place. Lastly, a focus on social learning about different actor perspectives, and a variety of options (requiring a level playing field) are prerequisites for change. The participation of, and interaction between, stakeholders forms a necessary basis for developing support for policies, and for engaging actors in reframing problems and solutions through social learning. These principles provide an analytical lens to assess how various stakeholders can deal with complex societal issues at different levels, but also develop and implement strategies to influence governance processes [16,17,18]. A strategic sphere: aimed at integrating and institutionalising long-term governance activities into the realm of policy-making. A tactical sphere: aimed at identifying interest-driven activities related to the dominant structures (regime) of societal (sub-) systems with the aim of driving integrated long-term governance. An operational sphere: aimed at encouraging innovation of societal, technological, institutional, and behavioural practices that introduce or operationalise new structures, cultures, routines, or actors. A reflective sphere: aimed at monitoring, assessing, and evaluating on-going policies and societal changes [16,19]. 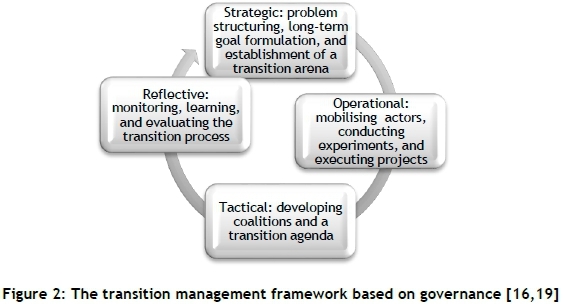 The transition management framework based on governance provides a practical approach to managing transitions of typical complex systems. For the IRP as a complex planning approach that is aimed at driving sustainability transitions within the electricity sector, the transitions management framework based on governance can help to address the current complex challenges facing the IRP process in terms of its coordination, competing sustainability views and policy challenges, vast stakeholder concerns, and overall governance challenges. South Africa's economy is energy-intensive, as the country uses a large amount of energy for every Rand of economic output, and is among the world's most carbon-intensive economies . An abundance of coal resources and subsidised coal-fired electricity has led to a reliance on energy-intensive mining and heavy industry as the historical drivers of economic development  - the so-called mineral-energy complex. Over the past two decades, South Africa's economic growth (income) has proved to be the main driver of electricity consumption in South Africa, and vice versa . It is in this context that, owing to its role in the South African economy, the electricity sector has been tasked with supporting key policy imperatives articulated by South Africa's first extensive National Development Plan 2030. Currently, the National Development Plan 2030 provides a strategic context for policies and planning instruments in South Africa . Some of the main strategic plans relevant to the electricity sector are shown in Table 1. The above-mentioned plans and policies are aimed at supporting South Africa's strategic sustainability policy imperatives, especially within the electricity sector. It should be noted that they have all been drafted by different national departments and ministries with diverse and varied constituencies and driven by different coalitions of interest groups. This has also directly led to challenges of non-alignment and poor coordination within the South African electricity planning process [35,36]. In terms of long-term planning and related sustainability goals and objectives, the South African electricity sector is guided and driven by the Integrated Resource Plan 2010 (IRP2010), which is a sub-set of the Integrated Energy Plan. The National Energy Regulator of South Africa completed the first National Integrated Resource Plan in 2002. The updated second National Integrated Resource Plan was completed in 2004, and the third National Integrated Resource Plan was completed in 2008. The current Integrated Resource Plan 2010 (IRP2010) was promulgated in May 2011, with unofficial updates in 2013. The latest update, IRP 2017 was approved by Cabinet in December 2017. Eskom, the state-owned national utility, previously developed Integrated Strategic Electricity Plans that provided strategic projections of supply-side electricity options to meet Eskom's long-term electricity load forecasts [36,37]. The long-term electricity-planning goal is to ensure sustainability while considering technical, economic, and social constraints and externalities. It is through the IRP that South Africa has strategically planned for electricity, while considering climate change (the national conditional target to curb carbon emissions), water resources, the role of independent power producers, employment, regional development and integration, and security of supply . South Africa's promulgated IRP2010 has faced criticism in relation to the outputs and the overall methodological and governance approach, including evidence that the current plan is misaligned with other strategic plans and the specific policy imperatives of low-carbon growth and sustainable development. Institutional and governance arrangements for implementing electricity-related plans and policies are currently dispersed . It has also been noted that the role of nuclear in South Africa's energy future is reflected in the plan - but not in the country's National Development Plan 2030 due to financial constraints [36, 38]. On the nuclear fleet, an analysis of the power plan by the Energy Research Centre  has suggested that information on the costs and capabilities of more flexible, smaller, modular nuclear reactors that are far more suitable for South Africa, given the uncertainty of demand and the large renewable energy resources, could be considered. Another identified gap is that a more integrated analysis approach could have been promoted to include interactions between the power and energy/water sectors and the rest of the economy. South Africa is expected to have a deficit of 234 gigalitres of water by 2025, as projected within the national accounts published by Statistics South Africa . There is thus an urgent need for the country's electricity plan and the National Water Resource Strategy to be aligned [40,41]. Another complex challenge is the notable omission of environmental and social impact assessments; this constitutes one of the major weaknesses of the IRP process. Similarly, the economic and financial impacts of the proposed generation mix could have received more attention, while the contribution of the IRP (and the energy policy as a whole) to the peripheral objectives (social, environmental, and industrial) has been marginal. Another complexity is the increasing prevalence of renewable energy, driven by independent power producers (IPPs) and small-scale embedded generation (SSEG) or 'behind meters' suppliers, resulting in a more decentralised and intermittent electricity supply for South Africa. This will affect various electricity sector actors that the electricity plan process has not considered. According to Hedden , various stakeholders within the electricity sector have also noted that the plan pays little attention to grid planning and does not explicitly address the electricity grid in terms of where, geographically, future electricity will come from, or who will produce it - including the geographical location of demand . Neither does the plan sufficiently define the proposed IPP institutional and governance structures, including the related existing barriers to renewable energy deployment in South Africa. It does not particularly deal with implementation mechanisms or rules and regulations [36,42]. The above points highlight the persistent complex challenges of the IRP development, implementation and adoption process, especially in relation to issues of governance and coordination. The South African electricity sector has been caught up by core political and economic interests, giving rise to an historically specific system of accumulation that constitutes the essence of the country's minerals-energy complex (MEC). In its earlier stages, South Africa's MEC consisted of the interrelationship between coal, electricity, and gold mining (as the core sectors), and later expanded into more complex relationships between mining, electricity, minerals beneficiation, and the crude oil- and coal-based petrochemical industries. Due to the dominance of its socio-political regime, this core structural complex economic system contextualises the country's politics relating to sustainability transitions [43,44, 45]. It has also been argued that the MEC, as a system of accumulation, has had a determining and retarding effect on South African industrialisation, which has led to the historical influence of a small number of large resource-based conglomerates over policy, now internationalised with privileged access to cheap energy, tax breaks, and infrastructure. These political economy factors still dominate the electricity sector and its associated integrated planning process . To highlight how the MEC still characterises South Africa's electricity sector and continues to impact the contemporary politics of energy transitions, Baker, Newell and Phillips , in their analysis of the IRP2010, highlight how the role of coal in the electricity plan has contributed to an increase in greenhouse gases (owing to new coal introduced in absolute terms), and has further increased electricity prices in the country to cover the true costs of generation. The role of new IPPs and the extent to which they can compete for resources and have access to the grid (especially while there are other players with entrenched vested interests) remains doubtful, since some players have more access to, and influence over, government decision-makers. The current national industrial demand is still based on fundamentally unaltered energy-intensive end-user practices. Despite changes in the generation mix, the uniquely electricity-intensive nature of South Africa's coal-fired economic growth strategy has not changed. Lastly, to highlight the overall complexity of electricity planning, Baker et al. illustrate that an apparently technical exercise, such as electricity modelling, can be inherently political, revealing the level of institutional power that traditional MEC stakeholders have - expressed as privileged access to decision-makers - and the influential role that the regime incumbents continue to play in South African electricity policy-making, despite the incremental steps taken by emerging renewable energy players and, indeed, the nuclear industry, to enter the energy regime [43,44,45]. Despite the MEC, the re-emergence of the green economy discourse since the onset of the global economic crisis in 2007/2008, and of sustainability transitions, has gained momentum and generated a major discussion about the next wave of South Africa's development cycle . South Africa is already undergoing a transition from coal-based abundant electricity-generation resources due to sustainability constraints, with interventions such as the Renewable Energy Independent Power Producer Procurement Programme; participation in the United Nations Framework Convention on Climate Change's Clean Development Mechanism under the Kyoto Protocol; the Energy and Environment Partnership; the Industrial Strategy Action Plan II; the Department of Science and Technology Energy Grand Challenge; the South African Energy Research, Development, and Innovation Strategy; the Renewable Energy Market Transformation Project; the assigning of carbon budgets to various energy-intensive sectors; the development of the Carbon Tax Policy; various environmental levies; and so forth [46,47]. This transitional shift in policy development and implementation has been termed 'low-carbon growth', or transitioning to a low-carbon, resilient economy . These programmes further illustrate that the transition in South Africa has begun but is unlike the orderly and managed processes of sustainability transitions normally observed in the literature. Here, 'sustainability transitions' refers to the structural changes required for long-term and complex reconfigurations of technology, policy, infrastructure, scientific knowledge, and social, political, and cultural practices, to attain South Africa's sustainability goals. According to Swilling, Musango and Wakeford , sustainability transitions can only be envisaged if the state facilitates a long-term structural transformation process that results in socio-technical transitions to more sustainable modes of production and consumption, with special reference to decarbonisation, resource efficiency, and ecosystem restoration [44,46]. (iii) Development of the Integrated Resource Plan, based on the outcome of the analysis. (ii) Consultations on the favoured balanced scenario that becomes the draft IRP. Despite these consultations as part of its governance process, the South African IRP, as a strategic planning approach, still faces persistent and complex challenges, especially in terms of its governance process as a whole, as previously discussed. It is thus proposed to embed the conceptual framework, shown in Figure 3, in the existing IRP process. It provides a governance-based approach to the existing South African strategic electricity planning process, taking into consideration South Africa's MEC challenges, and it aims to focus on learning, interaction, integration, and experimentation on the level of society instead of policy alone. Independent facilitation of this framework will contribute to the success of the overall strategic IRP process. Phase 1: Sustainability vision for South African electricity planning: This level contributes to, and forms part of, Step 1 of the IRP process. The South African sustainability transitions and vision will have to be defined as to how it relates to electricity planning in terms of the country's long-term national strategic plans and policies (Tables I and II). This level will also focus on the key electricity sector stakeholders from different backgrounds, and with whom various perceptions of long-term planning and possible directions for sustainability transitions can be robustly deliberated and subsequently integrated. Stakeholders, from their specific backgrounds and perspectives (for example, national government, business interests, Eskom/national utility, and civil society) will have different perceptions of South Africa's sustainability transitions. They should participate on a personal basis, and not as representatives of their institutions or based on their organisational backgrounds (government, business, science, civil society). Loorbach  proposes that stakeholders should be able to consider complex problems at a high level of abstraction; to look beyond the limits of their own discipline and background; to enjoy a certain level of authority within various networks; and to establish and explain visions of sustainability within their own networks. They should also be willing to work in teams where there may be different views, and be open to innovation, instead of having specific solutions in mind. During this process, the key stakeholders would also be brought together to review the persistent and complex problems raised about the IRP development process. The aim of defining a sustainability vision is to establish short- and long-term objectives, action points, related projects, and instruments to realise these objectives. This level can be used to contribute to, and shape, the IRP review process and its previous results. Phase 2: Definition of transition paths and scenarios for South African electricity planning: This level contributes to, and forms part of, Step 2 of the IRP process, and focuses on data collection and updates of input parameters. As part of the latter, considering current barriers to planning - political, regulatory, institutional, economic, consumer routines, stakeholder engagement issues, electricity supply and demand issues, physical infrastructure, cost of specific technologies, and externalities - will be prioritised. This level can be used to inform related scenarios for further exploration by developing transition scenarios, based on South Africa's sustainability vision. At this level, the stakeholders involved would have the capacity to 'translate' the defined sustainability transition electricity-planning vision and its consequences to the transition agenda of their own constituencies. This level contributes to, and forms part of, Step 3 of the IRP process. Here, various strategic initiatives, projects, and actions are carried out to broaden and scale-up existing and planned initiatives and actions, aiming to contribute practically and in a transparent manner to setting feasible scenarios and elaborating on required IRP analysis. The focus on the scenarios should be in the context of defined sustainability transition visions to ensure a clear portfolio of related transition experiments that complement and strengthen one another, make a contribution to the sustainability transition objective; can be scaled up, and are significant and measurable. Phase 4: Review of scenarios and analysis resulting in an integrated resource plan for South Africa: This level contributes to, and forms part of, Step 4 of the IRP process. At this level, the focus is on collective reflection on the IRP process. All the challenges mentioned previously are considered, including the latest solutions provided for improved planning in South Africa, outlining the continued steps of the IRP process, the rate of progress, the barriers to be removed, and including future approaches. The results contribute directly to the reviewed IRP modelling and analyses, thus providing a consolidated process view with clear direction on monitoring and review. 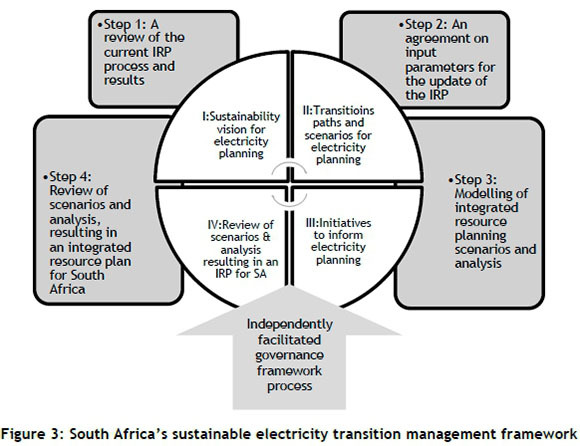 In this paper, a sustainable electricity transitions management framework, embedded in the existing key IRP process, is proposed for South African electricity planning. Theoretical gaps in the current integrated electricity planning process have pointed to the need to rethink the current strategic electricity planning theory and practice, with respect to South Africa's IRP. A combination of the planning and complexity theory and practice approaches was reviewed, together with a transition management framework as the basis for managing the transitioning of complex and persistent societal governance problems facing the IRP that are grounded in South Africa's MEC system. This sustainable electricity transition management framework proposes a complexity-based governance process approach, to ensure that different competing and complex sustainability policy objectives are aligned within the electricity planning process. The proposed framework attempts to manage diverse and varied constituencies (including their associated coalition interest groups) that have led to complex and persistent problems of non-alignment and poor coordination in South Africa. Further research is under way to examine the feasibility of the proposed framework. 1 Energy planning is a process or a tool of building and verifying strategies in an energy economy, while taking into account the analysis of energy supply and demand, and the means of implementation to ensure coverage of energy needs in a national or international context . 2 Complexity theory is the theory of multi-agent systems. Agency is attributed to all systems, sub-systems, and sub-system components, and not just to actors within a system . 3 Systems theory refers to a universal language to address complex patterns of interaction between different components in complex adaptive systems and offers a conceptual lens through which to analyse and understand societal and governance complexity . 4 Technology bias, institutional barriers, path dependencies, competing views, etc. .